Designed with diversity and efficiency, the Spyderco C11PSBBK Delica 4 Black FRN Combo Edge Folding Knife, a version of the sought-after Delica 4, boasts a VG-10 edge that is titanium carbonitride-coated to eliminate light refraction in covert situations. 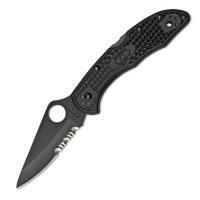 Spyderco C11PSBBK has a back with jimping, rendering it slip-resistant, as well as a form-fitted Bi-Directional Texturing® FRN grip for optimal ergonomics. The quad carry clip allows for heads-up/heads-down or horizontal right and left carry. The versatility of the Delica 4 FRN is like no other, and the sturdy factor of the device including a stainless handle skeleton that adds super strength but not weight.